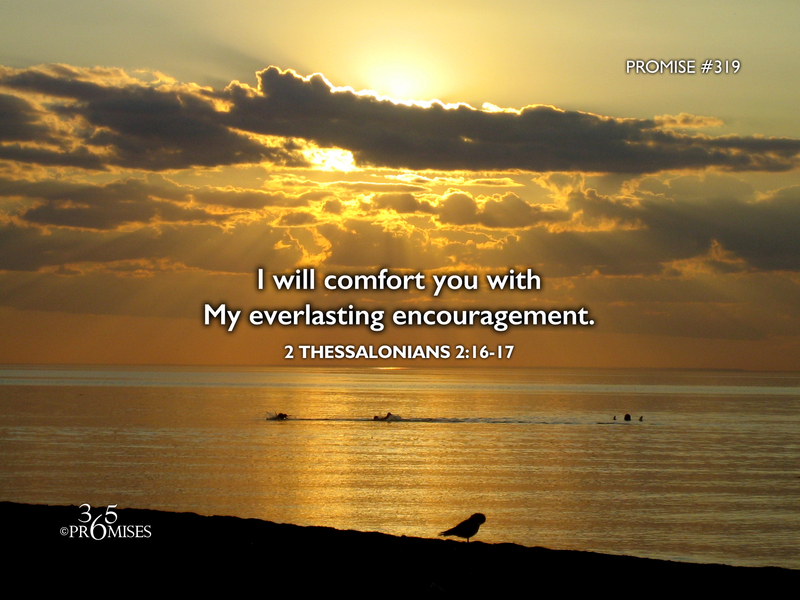 I will comfort you with My everlasting encouragement. 17 comfort your hearts and establish you in every good work and word. The NIV Bible says 2 Thessalonians 2:16-17 this way... 16 May our Lord Jesus Christ himself and God our Father, who loved us and by his grace gave us eternal encouragement and good hope, 17 encourage your hearts and strengthen you in every good deed and word. God is our eternal encourager. He never stops pouring out His love on us and He never stops encouraging us. I love the dictionary.com definition for the word 'encouragement'. ...to inspire with courage, spirit, or confidence: His coach encouraged him throughout the marathon race to keep on running. God is our friend, our Brother, our Father, and the lover of our soul. He has no self-interest but is wholeheartedly for us in every way. In Hebrews 12:1-2, the writer says that we should keep on running the unique race that the Father has set out for us, all the while fixing our eyes on Jesus, the author and perfecter of our faith. The race that is referred to in this passage of Scripture is the kind of race that was run within the walls of ancient stadiums with stands packed full of people! God the Father, God the Son and God the Holy Spirit are all cheering you on as you run your unique race today. You are being encouraged every day by all the resources of heaven to not give up, but to keep on going! The Triune God never tires giving us the encouragement that we need so that we might find the strength to do every good deed that is in line with our destiny.